What do you think it is? I'm guessing it's evidence from Anglo Irish Bank, chucked out in a hurry before the Gardaí raided. The good money we are throwing after bad, bailing out companies and mortgage holders. Heh. Like the throwing reference. 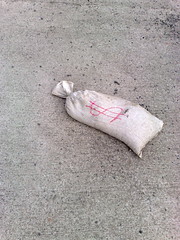 Having just seen "Millions" recently, all I can think of is that it must be a bag of stolen sterling. Cunningly disguised as dollars! Maybe robbers re-use bags & don't bother to change the currency sign. I don't suppose you spotted it somewhere between College Green and Clontarf? Did you drop it? Hmmm... I've had another claim. I'll have to ask you both to enumerate the contents. No, but you could ask these guys? Ooh, didn't hear about that.